CLICK HERE to order your e-Lights now! We also sell many different brackets to attach e-lights to your vintage Baby! A description of each one is given on the Products Page. CLICK HERE to order eLight brackets now! Most of our classic and collectible cars are not equipped with turn signals. We are required by law to signal turns using hand signals. But how many drivers behind us actually pay attention to those signals? Some of them may not even understand what we are trying to tell them! Introducing the Elights Directional Intention Lights: a simple, economical, easily-installed way to tell those drivers behind you what you have in mind. Turning right or left? Push a button and the very high visibility LEDs signal your intention. Need to slow down, park or otherwise tell everyone of a potential hazard? Push a button and four high visibility flashing red LED arrows instantly tell those behind you that there’s something they need to pay attention to. This is the product we’ve all been waiting for. Check the features below. Review the installation and operation videos. Then order your Elights Directional Intention Lights now! Check out these incredible ELight Features! • Wireless, battery-powered – NO HOLES TO DRILL, NO WIRES TO RUN, NO MAGNETS TO SCRATCH YOUR CHROME OR PAINT! • Installs in minutes using just a screwdriver. 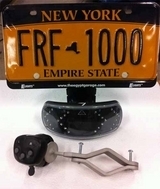 Installation is a snap with the included license plate bracket and universal steering column controller bracket. Click the link to see the Installation video. • Controller and light units are easily moved from car to car with low cost optional mounting brackets – One Elight set can serve your entire fleet! • ORDER NOW at the special introductory price of $150.00 + $12.00 shipping and taxes (if applicable) Your credit card will not be charged until your Elight ships. Click HERE to order. • Unconditional 30-day money-back guarantee: if you’re unhappy with your Elights Directional Intention Lights for ANY reason, ship it back and we’ll refund every nickel of your money. We’re that sure you’ll just love these! * This product is not intended to take the place of legally-required hand signals and is not sold to take the place of turn signals. Please drive carefully and legally at all times. CLICK on the Youtube Link below to see just how easy they are to install! We are Dedicated to the Pursuit of Happiness through the Restoration and Enjoyment of Old and Antique Automobiles.